Formerly of Albany, Alaska and Kelmscott. Died peacefully at Albany Community Hospice on 3rd April 2019. 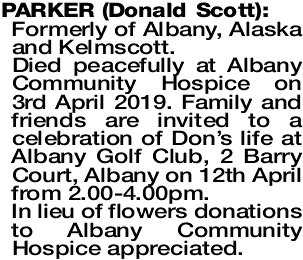 Family and friends are invited to a celebration of Don's life at Albany Golf Club, 2 Barry Court, Albany on 12th April from 2.00-4.00pm. In lieu of flowers donations to Albany Community Hospice appreciated. 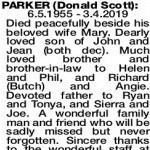 PARKER DONALD SCOTT 6.5.1955 - 3.4.2019 Died peacefully beside his beloved wife Mary. Dearly loved son of John and Jean (both dec). 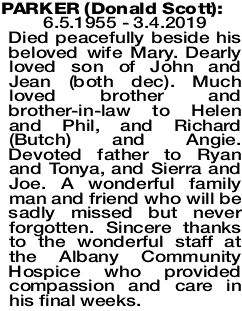 Much loved brother and brother-in-law to Helen and Phil, and Richard (Butch) and Angie. Devoted father to Ryan and Tonya, and Sierra and Joe. A wonderful family man and friend who will be sadly missed but never forgotten. Sincere thanks to the wonderful staff at the Albany Community Hospice who provided compassion and care in his final weeks.